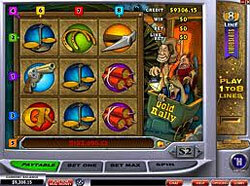 Slot machine payline is seen as the sequence of symbols on the reel. Active payline is the one the player has bet on. When the combination of symbols comes out with the stop of the reels, it is compared with winning combinations in slot payouts table. In case the combinations on the active paylines correspond to that of the payout table, the player is paid out due to the terms of payout for the certain combination represented in the pay schedule. Advanced video slots may have up to seven graphically represented reels each representing 3 rows of 5 symbols. Paylines can be represented horizontally, vertically, diagonally and even in zigzags, so sometimes it becomes very hard to find out how exactly you won. To start the game, prior to pushing the "Spin Reels" button the player is supposed to choose the number of coins and coin denomination for each slot machine payline he or she wishes to bet on. Thus a line bet is made. Then the player should choose the number of lines to bet. For example, if a player chooses to bet on three lines, his total betting amount will be three times his original bet on a single slot machine payline. This reduces the number of spins that would be needed for the same betting amount with the classical slot machine model. The overall process of the game becomes much faster, which is the main advantage of playing multi-line modern slots, apart from the excitement of betting on several paylines. One of the basic recommendations on how to win at slots is to bet on every payline while playing the video multi-line slots game. This may provide for winning maximum jackpot. For example, to win jackpot in a 50-line video slot game the player is supposed to bet all 50 paylines of the machine. The biggest drawback of such strategy is that rare player can afford to play for long being obliged to bet maximum amount of coins on each slot machine payline of the 50-line video slot machine. Nevertheless, there is nothing more frustrating than playing two or three lines in a multi-line slots game, as the player gets no chance to ever hit the jackpot.